Let's start with the two flagships of horticulture top lighting first, our CoolFin® and our CoolCube®. These high power coolers have an ultra compact design with an extreme cooling performance as high as 0.1K/W. Four individual horti COBs or LOBs, each under its individual lens, generate as much as 1800μmol in the PAR spectrum. The CoolFin® has been designed to generate a minimal overall height, so that it can be placed in grow containers and indoor spaces with low ceiling for horticulture cultivation without sunlight. The CoolCube® at his side has been created with the idea of minimal shading in glasshouse cultivation - with a width of only 20cm this cooler fits perfect under the construction bars of the glasshouses. Ready-to-go horticulture COBs have been brought to the market by Citizen and Lumileds, both aiming mainly at the blue and red spectrum. When you want your own spectrum or you want to play with your wavelengths and μmols during the time, we suggest you to go towards a LOB (LED-On-Board) design. We have made our own tests and experiments with Osram OS Oslon horti leds, Lumileds Sunplus 2020 packages and Cree horti packages and can show you stunning results. On a LOB board as small as 38x38mm, we place 140 watts of horti LED packages, creating as much as 380μmol/s or 2.7μmol/J for the experts. Four of those LOB LED packages can be managed simultanious by the coolers, creating easily up to 1500μmol/s. But that's not where we drew the line, we went that extra mile for you by creating the whole package of needed accessories to make your next horticulture top light project so much easier. Take for example our CoolView® lenses - specially for the lower installations we experience in glasshouses and grow containers, we have developed waterproof IP67 glass lenses in a perfect batwing light curve. From a height of just 5 meters you can create a beam as wide as 10 meter with a perfect uniformity of micromoles on the plants. Also the rest of accessories like the CoolConnect® 2X2HC COB or LOB led holders, mounting plates, AC connectors and waterproof glands are all made available off-the-shelf. All together the CoolFin® and the CoolCube® are the most powerful complete passive cooled horti top lights ever brought to the market. When you would need support in creating the perfect spectrum for your plants, let our experts assist you and we guarantee you the best PPFD performances on the market. And that's not all what MechaTronix has to offer on horticulture LED coolers… Look what you can do with our CoolBlock® modular LED cooler building blocks. With 3 formats pin fin coolers, specially light weight designed, we go from 50 watts or 130μmol all the way to 400μmol per block. Our easy CoolConnect® interconnection screws let you combine as many units as you want into a perfect horticulture top light. 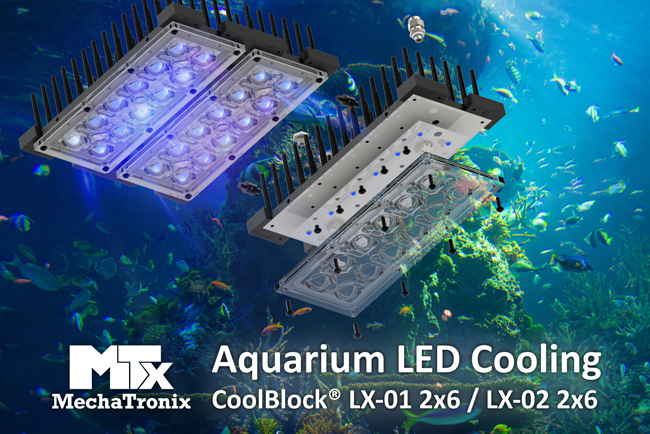 Need a LED top light cooler for your aquarium designs? Just a few CoolBlock® LX 2x6 assemblies next to each other give you the perfect blue based spectrum you want for your corals and algae, with more micromoles than you would ever expect. Fix spectrum or complete controllable multi channel spectrum for your horti application? 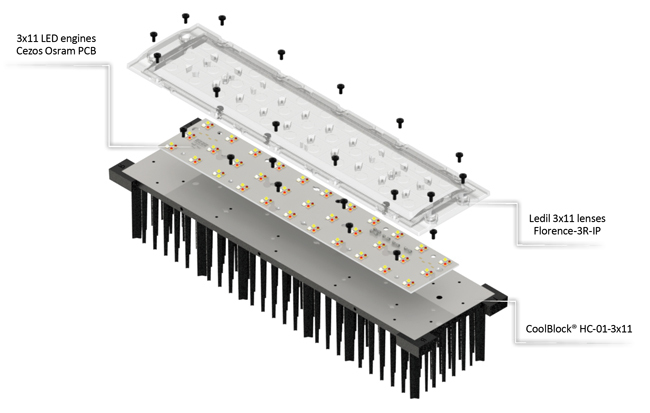 With the CoolBlock® HC 3x11 we can place 132 horti LED emitters on the board in as much as 8 individual channels, giving you the ultimate controls over your spectrum and outputs. Looking for an easy integration of these CoolBlock® led engines into a luminaire, try our CoolBeam® kits. Made to accommodate the 2X2MX CoolBlock® units, these kits start off from 3 units or an equivalent of 400μmol/S, and go all the way up to 1.600μmol/s. Last but not least when you look for a complete integration, your own looks or branding, try our custom engineering service. Not only we understand the thermal aspects which will lead to an ultra long lifetime, we have an eye for looks and designs what will make your next horticulture LED light outstand not only on performance.